^ For Billboard chart history see: Titus, Christa; Waddell, Ray (2005). 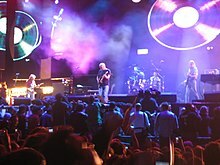 "Floyd's 'Dark Side' Celebrates Chart Milestone". Billboard. Retrieved 12 August 2012. ; for sales figures see: Smirke, Richard (16 March 2013). 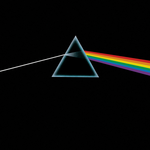 "Pink Floyd, 'The Dark Side of the Moon' At 40: Classic Track-By-Track Review". Billboard. Retrieved 22 June 2016. ; Povey 2008, p. 345: A US number 1. ^ "David Gilmour Performs Pink Floyd's "Remember a Day" in Tribute to Rick Wright" (Video). 15 September 2015. Retrieved 3 August 2016. ^ "Official Keith Emerson Website – Richard Wright Tribute by Keith Emerson". www.keithemerson.com. Retrieved 3 August 2016. ^ "Pink Floyd Detail Massive 27-Disc 'Early Years' Box Set". Rolling Stone. 28 July 2016. 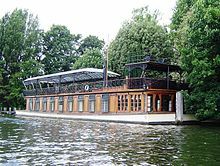 Retrieved 29 July 2016. 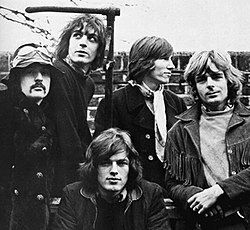 ^ "100 Greatest Artists: 51) Pink Floyd". Rolling Stone. 3 December 2010. Retrieved 2 August 2012. Bronson, Fred (1992). Weiler, Fred (ed.). The Billboard Book of Number One Hits. Billboard Books (3rd revised ed.). ISBN 978-0-8230-8298-8.
di Perna, Alan (2002). "Mysterious Ways". In Kitts, Jeff; Tolinski, Brad (eds.). Guitar World Presents: Pink Floyd. Hal Leonard. ISBN 978-0-7546-6708-7. Croskery, Patrick (2007). "Pigs Training Dogs to Exploit Sheep: Animals as a Beast Fable Dystopia". In Reisch, George A (ed.). Pink Floyd and Philosophy: Careful with that Axiom, Eugene!. Open Court. ISBN 978-0-8126-9636-3. Detmer, David (2007). 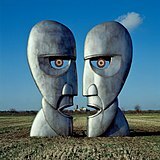 "Dragged Down by the Stone: Pink Floyd, Alienation, and the Pressures of Life". In Reisch, George A (ed.). 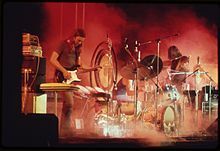 Pink Floyd and Philosophy: Careful with that Axiom, Eugene!. Open Court. ISBN 978-0-8126-9636-3. Hibbert, Tom (1996) . "Who the hell does Roger Waters think he is?". In MacDonald, Bruno (ed.). 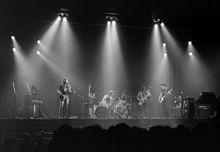 Pink Floyd: Through the Eyes of the Band, Its Fans and Foes. Da Capo. ISBN 978-0-306-80780-0. Mason, Nick (2005) . Dodd, Philip (ed.). Inside Out: A Personal History of Pink Floyd (Paperback ed.). Phoenix. ISBN 978-0-7538-1906-7. Reisch, George A (2007). "The Worms and the Wall: Michael Foucault on Syd Barrett". In Reisch, George A (ed.). Pink Floyd and Philosophy: Careful with that Axiom, Eugene!. Open Court. ISBN 978-0-8126-9636-3. O'Neill Surber, Jere (2007). "Wish You Were Here (But You Aren't): Pink Floyd and Non-Being". In Reisch, George A (ed.). Pink Floyd and Philosophy: Careful with that Axiom, Eugene!. Open Court. ISBN 978-0-8126-9636-3. Watts, Michael (1996) . 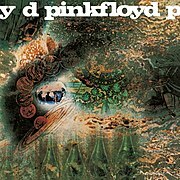 "Pink's muddled Meddle". In MacDonald, Bruno (ed.). Pink Floyd: Through the Eyes of the Band, Its Fans and Foes. Da Capo Press. ISBN 978-0-306-80780-0. Weinstein, Deena (2007). "Roger Waters: Artist of the Absurd". In Reisch, George A (ed.). Pink Floyd and Philosophy: Careful with that Axiom, Eugene!. Open Court. ISBN 978-0-8126-9636-3.